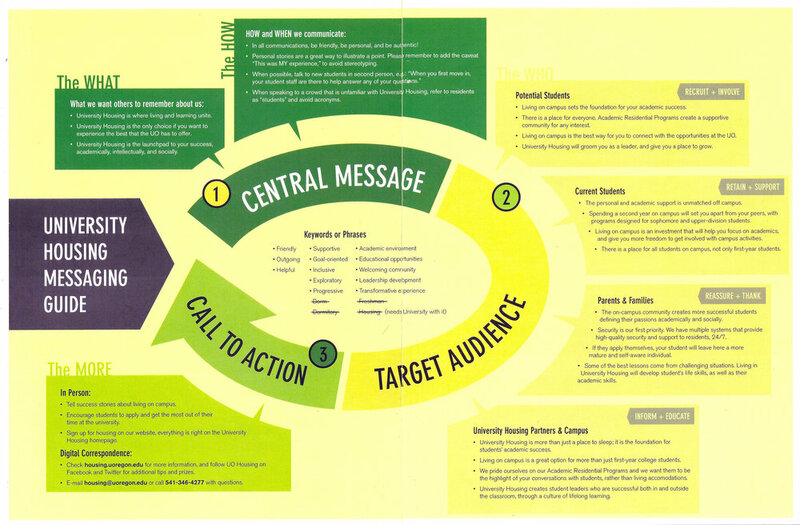 Research, strategy, copywriting and design of communication guide. As my summer job after graduating UO, I worked in the marketing department of University Housing. I used my 2 years of experience as a Resident Assistant to develop a messaging guide for staff to understand how to use language that would best resonate with different audiences: potential students, parents, and current students. Traditionally, second-year University students expect to live off campus. There are a host of reasons for this: freedom from the restriction of living in a residence hall, the ability to decorate one's home and throw house parties, and so on. But perhaps the biggest reason for living off campus, is the cultural expectation that Sophomores move out of the dorms. Despite all this, there are significant benefits to living on campus, and when the cost and time is all added up, living on campus may be the better choice for many students. During my time working at the Housing department, I conducted research and designed a cost vs. benefit outline that led to the development of mailers and a web app that was focused on second-year and returning students. These were intended to give students a thorough breakdown of costs and benefits of living on vs. off campus, and highlight the benefits like living close to classes, having one bill to pay, extra time to study, and fresh, healthy food readily available. Fold-out mailer below (created by another designer). After I left the job, University Housing used my outline to designed a web app as a digital version of the board game mailer above, which was emailed to returning students to get them thinking about all of the hidden costs and benefits of living on vs. off campus.